Golf entertainment has just gone to a new level in this country with the launch of Australia’s first Topgolf venue. 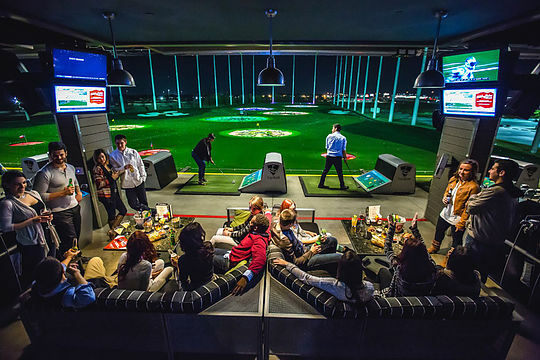 Not that you need to be driven “indoors” on the Gold Coast but at least that means you can play golf at night with Topgolf Gold Coast located right next to Warner Brothers Movie World. Actually it’s the non-golfers owners are hoping to attract as well as the rest of us desperate golfers keen for a hit of some kind. Basically guests are assigned a private hitting bay when they can choose from seven games and score points by hitting micro-chipped balls into targets. And while they are playing they can enjoy food from a top-class menu, as well as drinks, music and big-screen TVs. It’s described as a ‘fusion’ of play, food and music. Topgolf Australia chief executive Kirk Edwards explained that it was an exciting time for everyone involved with his team – with as many as 400 expected to be employed. “We’re focused on creating great times for all guests and we cannot wait to welcome the local community for an unforgettable experience,” said Edwards. Meanwhile Topgolf International president, Troy Warfield was just as thrilled with Australia’s latest golf attraction. “We are so excited to open our first Australian venue and we are looking forward to bringing Topgolf’s all-seasons entertainment experiences for the local communities to enjoy,” he said. The three-level venue is fitted with 90 climate-controlled hitting bays that can host up to six players at a time as well as about 250 square metres (2,690 square feet) of private event space for corporate and social gatherings.